Congratulations to the following recipients of awards at the Spring 2018 Region Meeting, and welcome Kim Terwilliger as Region Director! Eastern Division Patroller Achievement Award: Jason O'D. 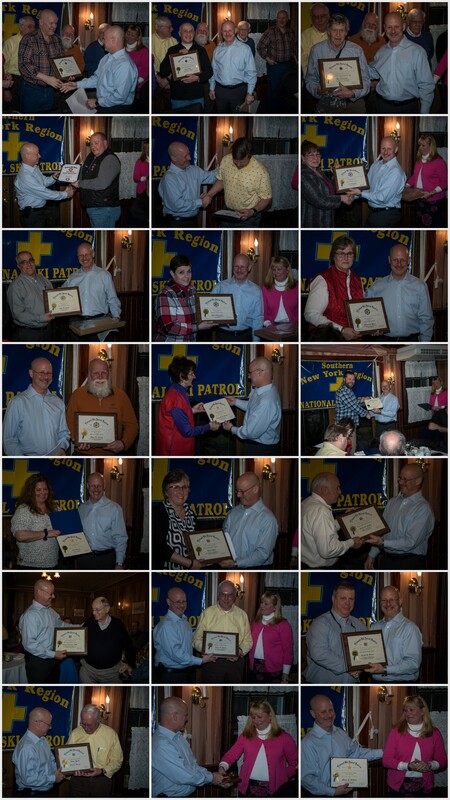 Eastern Division Patroller Achievement Award: Jim M.
Meritorious Service Award: Aiba D.
Meritorious Service Award: John S.
Meritorious Service Award: Hildy S.
Meritorious Service Award: Patricia B.
Meritorious Service Award: Roger C.
Yellow Merit Star: Rosina M.
Yellow Merit Star: C.T. W.
Yellow Merit Star: Janet H.
Yellow Merit Star: Mike M.
Distinguished Service Award: Donna K.
Distinguished Service Award: Jerald R.
Distinguished Service Award: Joseph L.
Distinguished Service Award: Ritch P.
Distinguished Service Award: Joe S.
Mantle of command passed to Kim T.
So you have been an NSP Member for a few years and you have seen a few awards presentations - Merit Stars, Appointments and Service Awards. You know how rewarding recognition is for people, and I'm sure you know fellow Patrollers who deserve some. How about getting involved with awards at your Patrol? Or maybe you just want to get the ball rolling for one special person who has shown great leadership or done a great job with a Patrol activity for a long time. Where do you start? Step 1 is to go the the NSP website, click the Member Services Tab, and then go to Policies and Procedures. Chapter 12 contains everything you need to know about NSP awards. Take a few minutes to read through it. You will have an idea of the intent and the nomination process for every NSP award. Most NSP awards can be applied-for all year, only the "Outstanding" awards have a deadline and in the Eastern Division that deadline is March 1st. All of the awards listed in Chapter 12 require several levels of approval and must come to me from your Region Awards Advisor. They must also be on the latest version of the nomination form and should be accompanied by a support letter written and signed by the sponsor. The only reliable source for the latest nomination forms is the NSP website. Although hard copies with signatures are currently required, an electronic copy is also helpful at each step along the way so minor corrections or changes can be made. If you have questions start with your Patrol Awards Advisor followed by your Region Awards Advisor and if they can't answer them, contact me. Even if you just want to send me an email listing a fellow Patroller's accomplishments, I will be happy to tell you what award that Patroller might deserve. I know that the process may seem very involved but there are people at every step along the way to advise and assist. I also know the satisfaction of seeing a fellow Patroller receive the recognition they deserve. Use the Contact Us page to reach our Awards advisor for more information.